She stared on, ahead. I won’t know if she heard. (flatlining is what a heart monitor does as the heart progressively weakens, the final flat line indicating death). This calm and moving ending might seem a little bare if it didn’t come after a whole process of transition. Terms are at first large-scale: “God is great” – “Queen Elizabeth maternity ward” – “God’s breath in man” (Herbert: God breathing life into Adam) — “heav’n and earth . . . ” The expanded tone is brought carefully down step by step through Herbert’s intimate devotional phrases, as forms of prayer. The next step down is to “a Hereford hospital bed” –and the poem’s descent then reaches its crisis, where prayer is cancelled in his reaction to news of his mother’s cancer: “ . . . an animal noise, hurled language’s hurt”. But the movement continues irrevocably: “her rings were off” and we reach the still, small voice, his, at the end, the smallest prayer of them all. These are not events, but words, contemplated in a meaningful succession. They are not symbols and the poem is not an emblematic narrative of birth and death; they are the vocabulary of the actuality, which gains a resonance through its very accuracy. And the poem’s coherence, or, if you like, its form, is produced by the mental calm with which it is told. Nor is it a statement of religious belief; “mouth at her ear” is the phrase which coheres the whole poem, because it completes an elliptical course from separation to coming-together where the pain of distance is all the more sharp at the settlement, the contract fulfilled, and because it stands as sentinel over the closure as a human act performed perfectly. Most of Kunial’s poems are directly personal, first-person accounts of the experience of facing difficulties and they are addressed, either to an identified person or straightforwardly to the reader. One commenter puts this as “it only serves to remind him of his own inarticulacy. English, the language of the poem, cannot serve him, and can only serve to half-capture the meanings of his own life.” And yet the whole book shows a perfect command of English including English as a language for poetry — after all, he did get there in the end, as he says. “Inarticulate” would be the last word you’d want to use to describe his writing. Here I begin to suspect some play-acting. It is mainly the poems focused on racial mixing that bear this kind of negative diagnosis. In “Self Portrait as Bottom” he takes a genetics test with the result “50% Europe. 50% Asia” but insists on considering the finer detail of the test result, which involves him in Britain, Ireland, Scandinavia, Finland, Caucasus . . . and settles on a mere 1% “Italy. Greece” where his mother and father could almost meet. shaped test tube . . . REVIEWS AND AWARD comments directed at him have emphasised race almost exclusively. But it is not simply the cliché of “searching for his roots”. I don’t think it is even “his mixed race identity” and I certainly don’t think he portrays himself as victim of a “sincere identity conflict”, or no more so than any citizen of this deeply divided country on the edge of a continent and a vast spread of culture far beyond the borders of Europe, which we are about to abandon. Whether they start from a word in Pahari-Potwali or not, Kunial’s philological (or not) meditations as they progress through the process of word and poem engage with Herbert, Donne, Shakespeare, Austen, Coleridge, Dickens and more. One stanza begins in Old English – “Hwaer cwom mearg? Hwaercwom mago / “Where is the horse gone? Where is the young man?” and leaps through Middle English (“Uuere beþ þey biforen vs weren”) reaching his present tense where the child asks the mother, Where’s gone Daddy? Daddy is in the country called Back Home. The as-if last-minute appending of that question, plural or singular, makes the whole issue more complicated and subtle as against such alternatives as the easy invocation of the word “white” to cover the harm of centuries, regardless of persons. Kunial’s whole manner of poetical writing is mostly very straightforward, saying exactly what it says, with a constant sense of calm reasoning. As well as in the resolutions of many of the poems, this pact is given us in Kunial’s whole manner of poetical writing, mostly very straightforward, saying exactly what it says, with a constant sense of calm reasoning. It is consistently “measured” in the popular sense, though the longer lines (such as the second and last of the above excerpt) are rarely entirely free of the hint of the pentameter. Even the pieces in prose seem to have a prosody behind them which assures a steady and deliberate movement, a lyrical calm at every step. Rhyme, word-play, phonetics, are all handled pointedly as well as subtly. The avoidance of emphasis at “won’t know” rather than “shall never know” is typical. the rumour of my own being. Later this word with a missing vowel is reduced to the one letter W, and in the final section of the poem this searching among words and letters restores the missing vowel and agrees that the divided language is a damage, but a damage which is immediately healed. that blows me into being. It’s all there, in a way which won’t allow us to read it as a recognised generality. The language elements tangling with each other, and the work of locating them, are the resolution. when I borrow the line between your lips. Anger is not to the forefront in this writing, neither is self-pity, and the poet does not mount a platform on behalf of whole nations. It is an entirely different form of foreignness which translates the difficulties into the inner healing properties of words from anywhere in the world. The tenor of the writing is constantly calm and contemplative however worried, and the divided condition which causes the worry also provides the opportunities and occasions for the poems, like sudden oriental gems. 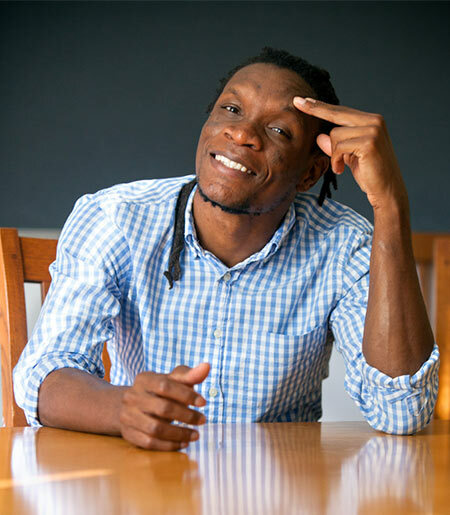 IN 2012 I HEARD part of a reading by Ishion Hutchinson and at once bought his book (Far District, Peepal Tree Press 2010). I didn’t hear much, but it struck me as a kind of writing which I constantly watch out for and recognise instantly, something that strikes a chord. This could be a manifestation of “craft” in modern poetry, meaning a practised human skill in renewing the structures of language, until they begin to relinquish their obduracy, and cracks appear in them through which you begin to see glimpses of the opposing world. A quest for hope which can be felt in the very sound of the words, the weight, swiftness and continuity and free range of the thought that pushes the poetry forward. That first book is much concerned with scenes and events of unprotected poverty in his past in a rural “Outer Eden”, seen at a distance which allows a gloss of comedy and irony. They are set against a whole world of learning, poetry, literature, antiquity, mythology which is his escape route and in which his distinctly modern handling of language is formed. The title sequence is a particularly telling and absorbing theatre of this distant paradise in a state of distress. In Hutchinson’s second book, his resources are wider and more varied, both as a field of reference and in the workings of language. House of Lords and Commons continues this quest, but the resources are wider and more varied, both as a field of reference and in the workings of language. He faces a much more extensive confrontation with “Western” poetry, art, and culture and has gained a great facility in turning the conflicts, tensions and harmonies involved into a drama of real extent and relevance. He likes to write in long sentences, one of which may sometimes occupy an entire page-length poem, in which he presses on relentlessly with an account which is liable to end as a question and a challenge. There is an important feature which he retains from the earlier book, concerning the way into the poem. However, Modernism (not the Pound one, more like the Stevens one or the British one) charges through the text in long strides; each poem bears a familiarity of genre: there is an evident subject from the start and the poems offer to do what poems of that kind are normally expected to do. Familiarity or verbal comfort may end with the first word, but still the poem, or the poem’s skeleton, performs the actions expected of it, which will usually take the form of an account or an address. So what you start in you stay in, meaning there is a limit to the disruption the poet inflicts on the reader, and what he does inflict is as much a matter of a shared delight before the flexibility of language as depth wisdom. In fact the “serious” side of things is more political, in referencing a long history of disadvantaged living. And whatever is radical in the writing co-exists with a determination not to let go, of local affection or of classical completion. who no longer knows the way to die. Of course it is not without unanswered questions, occurring mainly as the intrusion of single unpredicated words, from the first rather laboured pun on rain/reign to the apocalyptic event at the end, which is neither surrealism nor symbolism, but, I think, simply an authentic enhancement of resource brought out by a climactic narrative. cave before the first spark of flint. This lofty tone is new and he takes it on with ease, opening up distant large-scale history as subject-matter. So off we go with our classical dictionaries, but that is hardly to begin and remains subject to the more real understanding which offers itself to the text rather than demands one of it. Most of the poems are accounts of various recognised kinds, such as elegy and legend; also story, tale, anecdote, dream story . . .
on to belt her savage choir. in which small units of language are disjointed and cannot be merged by circumvention or paraphrase, but the whole coheres as a lyric, not without possible touches of comedy. For a long time in the West any writing which is close to this in its “impenetrability” has been popularly despised as elitist. Yet taken the right way, as Hutchinson’s touches of playfulness encourage, it is so easeful. House of Lords and Commons was reviewed in The Guardian 9th December 2017, by Sandeep Parmar and if what she says is right I have missed the whole point. It would not be the first time. Her claim is that the colonial history of Jamaica, which is a matter principally of conqueror and victim, slavery and sugar cane plantations, informs and motivates all Hutchinson’s poetry, without displacing any of the evident subject matter. I THINK THIS IS not a question of composition, but of interpretation. How far is interpretation willing to go in drawing a line round the poem or the entire oeuvre which cannot be transgressed, and declaring that the harm of colonisation is not merely its only concern, but, given the poet’s position, its only possible concern. And that as a first-person poetry it will always represent the poet’s quest for a personal identity in conditions of society and language which make that especially difficult through cultural dominance. It may even go so far as to define the poetry in this way whether the poet likes it or not: whatever he writes will agree to these readings not because of what he writes so much as of what he is: a Jamaican black. This is made easier, of course, by the techniques of poetical subversion so well developed now in the younger academy, where the strategy with any poem is to dive immediately to what it does not say, but “is there”, proven by recourse to etymology, psychology, imagery or other arts of subversion. Does every poem, whatever its subject, become an attack on the whole “white” world…and on every citizen thereof individually? But Hutchinson’s poetry seems not to stress it so strongly and uniformly, and does not so comprehensively project the field of perception as a haunted house. The poems convey the complex allure of Hutchison’s native Jamaican landscape, and the violent forces that shaped its history, with remarkable lyric precision. But they speak far beyond Caribbean experience, thanks to the author’s uncanny ability to reach the universal within the local. confused and coke bubbles on tinfoil to cemented wreath. missiles talk, I talk that switch I call Melchizedek . . .
all were lost all were drowned. I immediately took that ending as a reference to the infamous event of 1781 when the crew of the slave ship “Zong” murdered more then 130 African slaves by throwing them into the sea, to lessen the demand for fresh water which they were running out of, and in order to be able to claim insurance. 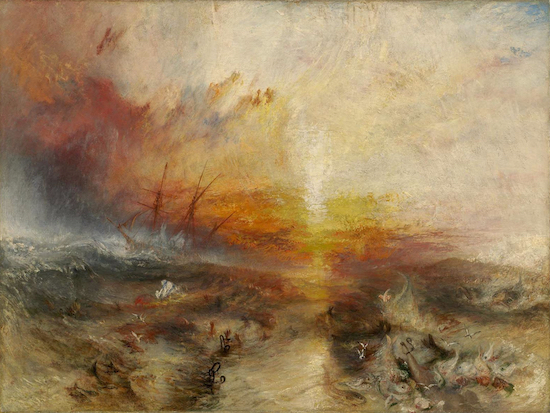 It was the basis of Turner’s painting “The Slave Ship” of 1840. I still think this is right, in spite of the isolation of the last line from the rest of the poem, and even though the “Zong” was not on fire, and neither was the ship in Turner’s painting. But holding this history surely does not prevent the poem’s ending from holding other histories or conditions which neither poet nor reader necessarily recognise. Similarly, Sandeep Parmar is surely right to say, “’A Burnt Ship’ illustrates the poet’s range of linguistic possibility. In a single dreamlike list the reader is transported from ancient Mesopotamia to the horrors of the ‘whipped backs’ of slaves.” This was exactly how I read it at first sight, but without wanting to fuss about small details, I also have to notice that the poem says “whipped backs” but does not say “of slaves”. Of course if you put “whipped backs” and “Jamaica” together you get slaves. I like to think that by avoiding a fully specific notation the poet, intentionally or not, leaves a small crack of daylight open to anywhere else in the world. 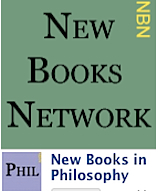 Peter Riley, the poetry editor of The Fortnightly Review‘s New Series, is a former editor of Collection, and the author of fifteen books of poetry (including The Glacial Stairway [Carcanet, 2011]) – and some of prose. 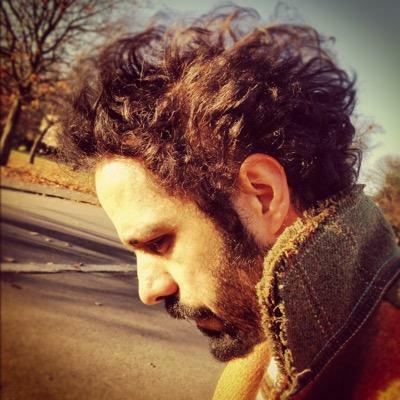 He lives in Yorkshire and is the recipient of a 2012 Cholmondeley Award for poetry. Peter Riley’s latest books are Pennine Tales and Hushings (both from Calder Valley Poetry) and Dawn Songs (Shearsman, 2017). His Due North (Shearsman), a book-length poem, was shortlisted for the Forward Prize for Best Collection, 2015. 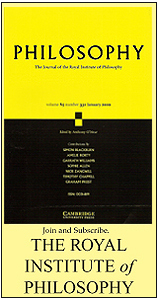 A collection of his ‘Poetry Notes’ columns has been collected in The Fortnightly Reviews: Poetry Notes 2012-2014, and published in 2015 by Odd Volumes, our imprint. 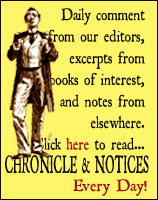 An archive of his Fortnightly columns is here. See particularly the recent work of D.S. Marriott where it seems that personal, psychological, social, political and many other forms of damage are owed principally to the eighteenth-century transatlantic slave trade and its aftermath, fundamentally the reduction of the entire person to a sellable and negotiable object, amounting to a complete image transformation of the space inhabited. Reviewed, unfortunately rather naïvely, by me, here. Publication: Tuesday, 22 January 2019, at 12:20.